You are currently browsing the tag archive for the ‘navy’ tag. In ‘The Mighty Navy’ Popeye follows Porky Pig (‘Meet John Doughboy‘) and Barney Bear (‘The Rookie Bear’) and joins the army. As a sailor, he naturally chooses the navy. Thus, at the start of the cartoon, we find him on a training ship. However, being a navy sailor turns out to be quite different, and most of the humor comes from Popeye’s inapt ways of being a navy sailor. “Do I wants to be a sailor? I AM a sailor! I’m Popeye the sailor! I was born a sailor“, Popeye exclaims at one point. But despite his lifelong experience, Popeye’s ways of hoisting an anchor, aiming the guns and flying a dive bomber in no way convince his superior, so he’s sent to the kitchen to peel onions. Yet, when the training ship is under attack, Popeye saves the day. ‘The Mighty Navy’ was released only thirteen days before the Japanese attack on Pearl Harbor, and thus the enemy is neither named nor seen in this cartoon. The enemy’s fleet flag bears ‘The Enemy (Name Your Own)’, and when Popeye disposes of its fleet, no victim can be seen. This in sharp contrast to the post-Pearl Harbor Popeye cartoons by the Famous studios: now the Japanese were clearly identified, and racial stereotypes roamed wildly. None of that in this cartoon, making it much more fun to watch. ‘The Mighty Navy’ seems to be a tribute cartoon to the navy. Apart from Popeye, all sailors look like Superman, and the navy itself isn’t ridiculed at all. 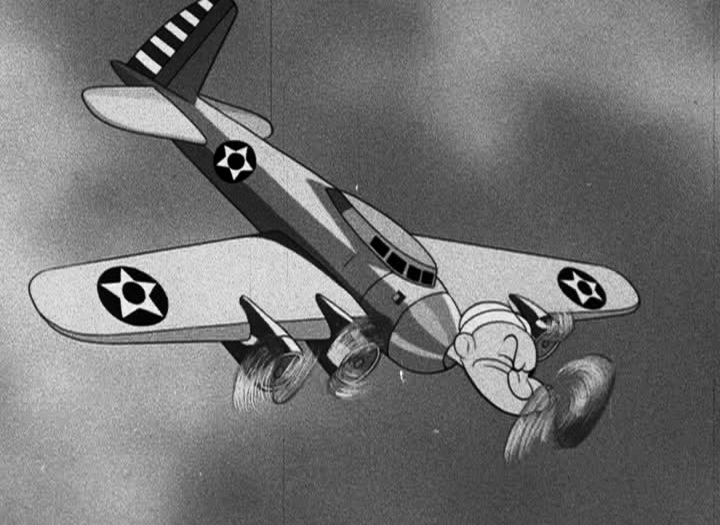 Instead, the cartoon looks like a celebration of the navy’s choice to make Popeye the official insignia for its own bomber squad. 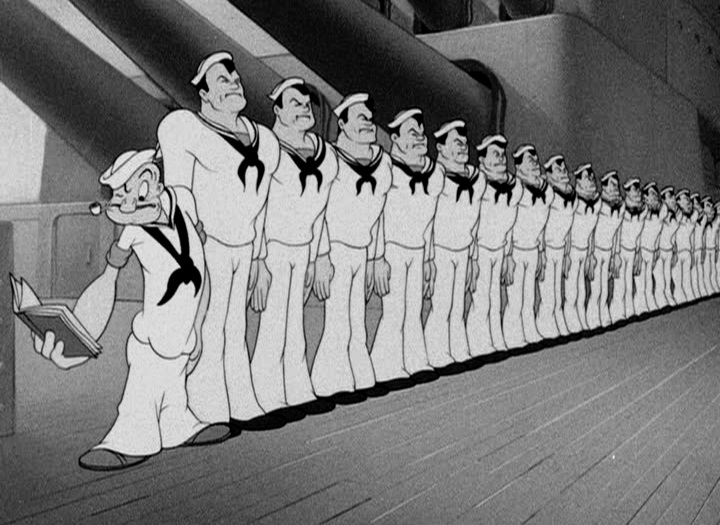 In the insignia, which is presented to the character himself at the end of the cartoon, Popeye looks like his older self, but in ‘The Mighty Navy’ Popeye’s clothes have changed into navy white. I don’t think that this was meant to be a permanent change of dress. Indeed, in Popeye’s next cartoon, ‘Nix on Hypnotricks’ Popeye wears his old clothes again. Yet, in most of his following cartoons, he would be dressed in navy white, and it’s in this dress he would be seen the rest of his theatrical career. After ‘Momotaro’s Sky Adventure‘ Aoji and Murata send Japan’s folk hero off in a military submarine to fight a large shark. Like in his earlier film Momotaro is asked by others to do that, and the film vaguely seems to glorify the navy, even though it’s much less successful in doing so than Momotaro’s earlier nationalist film was for the air force: the film runs rather short, Murata’s 1920s style animation is not particularly exciting or convincing, and for today’s audiences it’s quite unsettling to watch the hero fighting a large fish with a surplus of warfare, including numerous torpedoes. The Japanese clearly had less difficulties with this slaughter. In any case, the hero, and his friends Monkey and Dog (Crane couldn’t join them as he can’t swim) are awarded as heroes at the end of the cartoon. ‘Momotaro’s Underwater Adventure’ is available on the Japanese DVD Box Set ‘Japanese Anime Classic Collection’. Popeye had joined the navy before the United States entered the war, in ‘The Mighty Navy‘ (November 1941), so in ‘Blunder Below’ he’s ready to fight the enemy, the first major cartoon star to do so on the movie screen. In the first part of this cartoon Popeye tries to be a normal sailor, among Superman-like sailors, trying to learn gunning. He is no talent, however, blundering away and almost shooting down the captain by accident. But when a submarine approaches, Popeye shows his real worth: he beats the submarine single-handedly, saving the battle cruiser. It’s this great combination of clumsiness and superhuman powers which make Popeye such an appealing character.